It took a long time for me to get used to the idea of water in the garden and to realize that there is a great continuum of what it means to have water in the garden. Last week I joined 60 other garden bloggers in Minneapolis to visit 22 gardens, private, public, and university gardens. And I can state there was water in every single one. We can all have water in our gardens. Many gardeners arranged to have water because they wanted to attract birds. A bird bath can be pretty, but the water evaporates so quickly. I have been told by bird lovers that a fountain is more desirable because the sound of water is what really attracts birds. 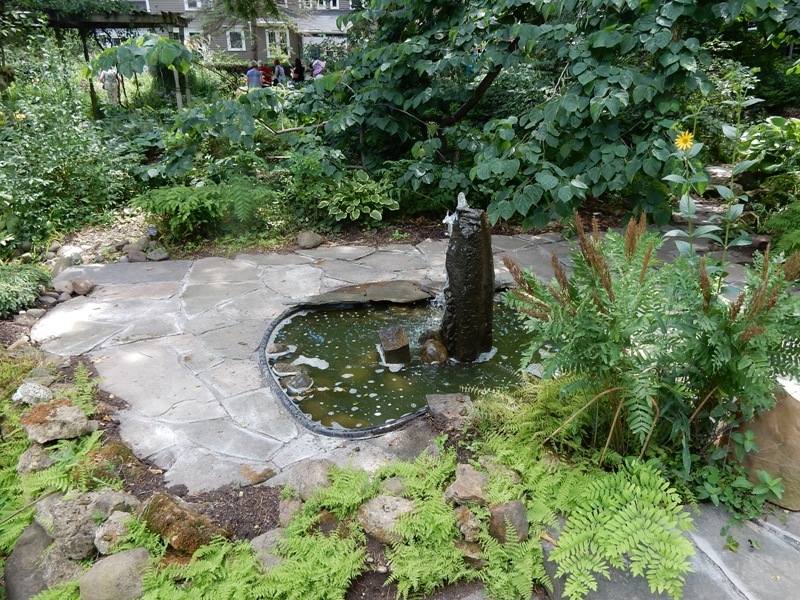 Here is my tour of some of the Minneapolis garden water features, some small, and one larger than most of us will ever have. Dianne and Dan’s garden had all manner of delights from a small cutting garden, a variety of perennials, and beautiful trees. In one shady border that included a collection of conifers there was a small fountain to attract the birds. It was set so that the birds would have a place to shelter if they were startled. Dianne and Dan also had a white gazebo nestled in a mixed bed of heritabe tomatoes, perennials, and a beautiful collection of lilies which are Dianne’s specialty and five espaliered apple trees that are Dan’s project. 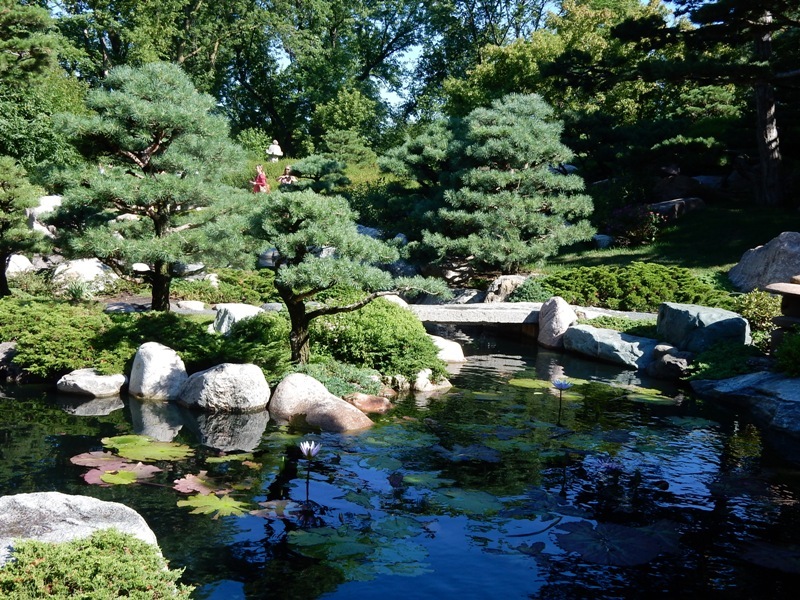 That area also included a water lily and lotus pond, providing a serene view for all who visit. Ruth is a member of the Wild Ones organization whose goal is to educate and advocate for the necessity of native plants in home gardens. In that spirit Ruth had lots of labels on her mass native plantings to attract pollinators. Her small stone lined pool with its spouting shower fountain made a delightful cooling sound. Ruth said it was important to her to have a fountain that she could listen to. A pool like this is now within the reach of almost anyone because of the magic of electrical recirculating pumps. The owner of the Squire House is a garden designer. His garden is divided into several rooms which include different types of fountains. There were several bird bath types of fountain and a small rectangular pool set in a stone patio with a showering spout fountain. The fountain I liked best of all was a rough dark stone pillar with a burbling flow of water that fell into a small basin surrounded by flagstones. 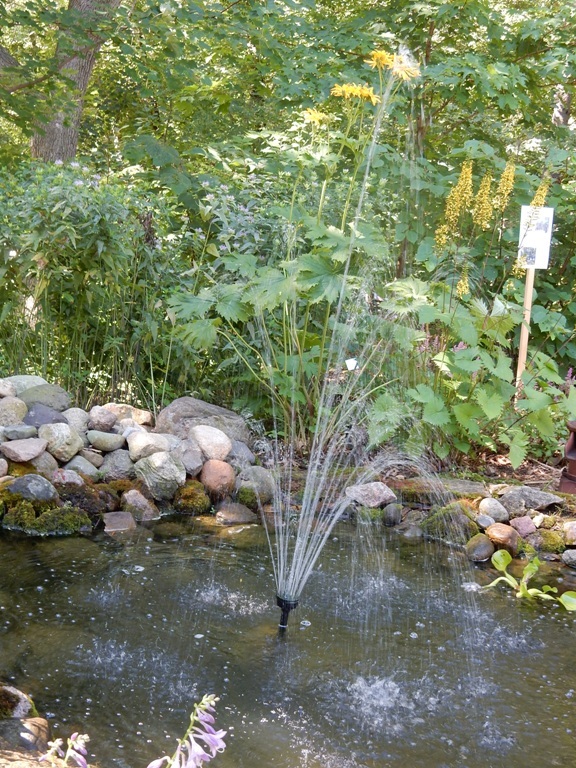 The fountain was set on a raised level at one end of a slightly sunken formal vegetable garden. Though the garden was formal, the ferns growing between the field stones in the rough wall and along the shallow stairs gave this fountain a woodland feel. Linda has a particular interest in conifers, but this varied garden includes ferns, hostas, and colorful annuals, but the real showstopper is the 100 foot long stream that sings its way down the slope, framed by low evergreens, golden creeping jenny and ferns on either side. 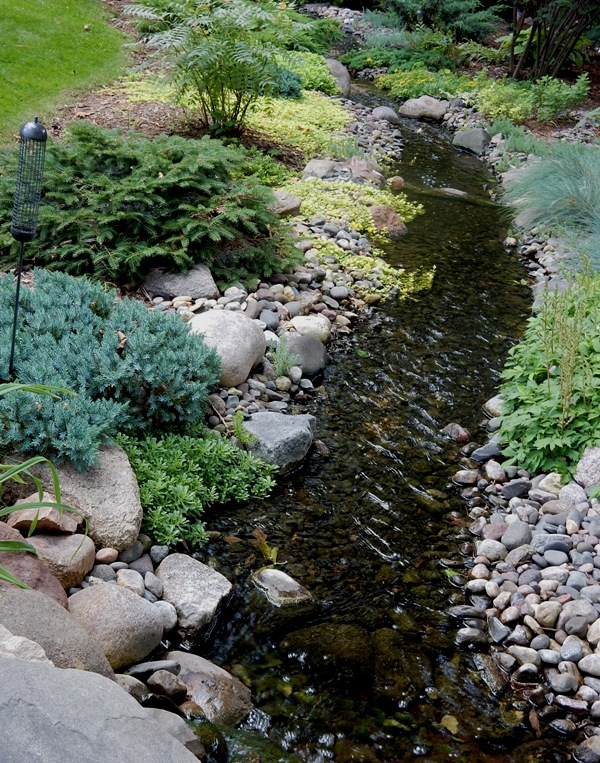 This man-made stream depends on a concrete base that is hidden by the artful arrangement of stones. Like Dianne with her lotus pond, Linda had a lot of advice about the necessity for good concrete work. I’ve described various kinds of water features that are just what Beverely Nichols ordered, but he would never be able to top Nancy’s water feature – a lake. I had never connected Minnesota with Land O Lakes butter. We were invited to have our lunch in her lakeside garden, a delicious (literally) respite. 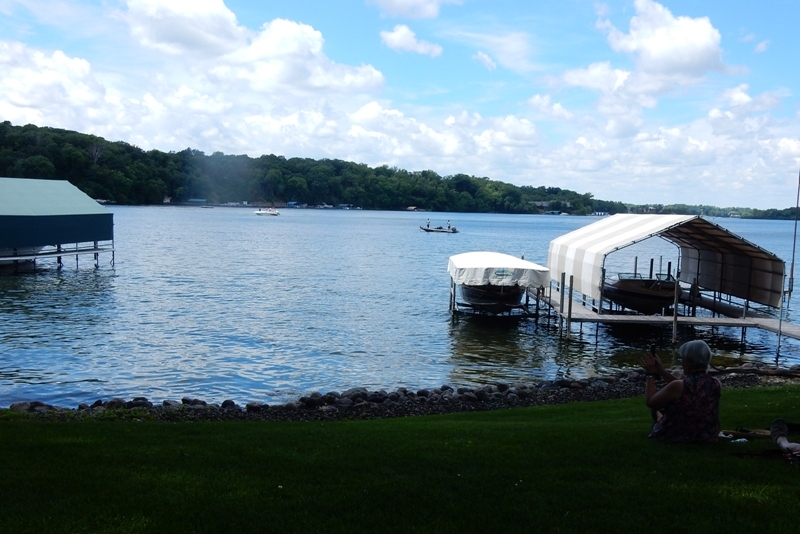 Our tour was enjoying comfortable summer temperatures, but after walking through five sunny gardens that morning we were all ready to collapse in the shade, enjoy our box lunches, and relax with a view of the tranquil lake. After we had eaten and been revived by the lake breezes we wandered around the garden with its array of fairy gardens sometimes inspired by, and sometimes created by children. We also admired the mass plantings in front of the house. It seems that Minnesota gardeners are passionate about supporting their pollinators. So far my garden has an old birdbath surrounded by tall scarlet bee balm, a fat summersweet, and a weeping cherry that provide some protection. But there is no music, no splashing plashing water. However, as we arranged for the kitchen renovation, we made sure the electrician included an outdoor outlet on the west wall of the house. There is already a spigot and with an electrical outlet I’ll have almost everything I need for my own water feature. The stones and the pump will come. What a great approach to the Fling! You put it all together in such a thoughtful and inspiring way. Now that all the koi have disappeared from my garden pond, I can take advantage of your tip and try a fountain. Rebecca – I am trying to figure out a fountain for my garden. I just visited a local garden and the gardener has a little stone patio nestled between her entry and the corner of the house which is sheltered with trees and shrubs. The stone patio includes a tiny pool with a spouting fountain – and it is all very small – but so cool, peaceful and welcoming. A nice approach to Fling coverage! It was great to get to know you in person, Pat! 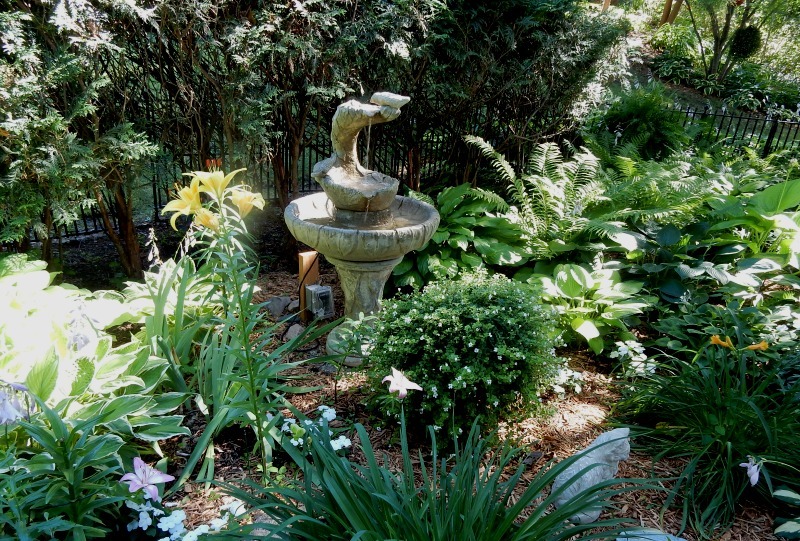 Those water features add so much personality and wildlife value to a garden. We have an above-ground pond that my husband created, and it’s fun to see the birds enjoying the aerated water. Great post! Wendy – Thanks for the link. We will be thinking of ways to get moving water in the new garden. I have an electrical outlet at the back of the house now. Beth – I was so glad to see those gardens with you. And look forward to see gardens and plants you post – from Minneapolis and beyond.